Lately I have been using Karla, an outstanding grotesque sans serif typeface by Jonathan Pinhorn, for some print and web projects — it is used on the Greyscale Press website, in the upcoming Aether9 book, and on a new website under development. the cedilla (ç) and oe ligature (œ) were missing – they are pretty common in French. the height of the apostrophe is lower than usual – it’s noticable in combinations like l’ or d’, which are frequent in French. the q has a very quirky design – that’s a nice touch of character in English, where it’s quite rare, but in French it’s standing out a bit too much. Since the font is open source (under the OFL licence), nothing prevents anyone from modifying the font — and that’s what I did (having no other choice, since it’s creator is busy churning out Indian typefaces). I used FontForge (thanks to the knowledge gathered by reading the Fontes Libres book and following a workshop by Dave Crossland this summer). The resulting files are here, on GitHub. It’s really not much more than a quick hack: I added the cedilla from another open source font (Arimo, by Steve Matteson), and moved a few vectors around. 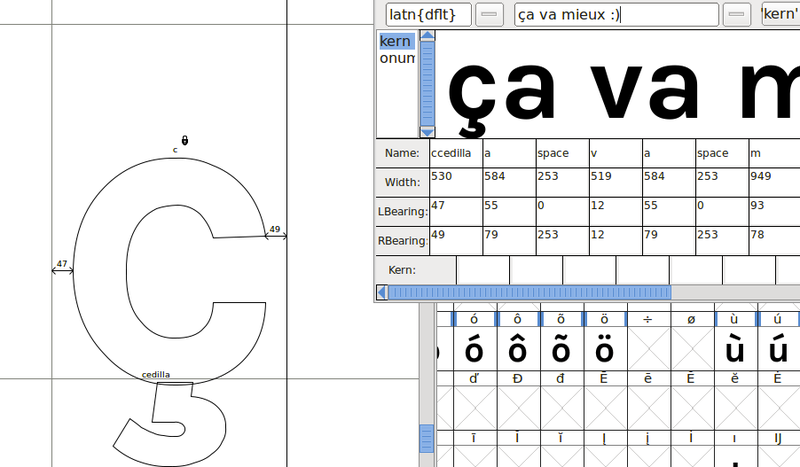 But it works fine and does the job: French text can now be typeset safely with Karla. Since the OFL licence requires any modified versions to use a different Reserved Font Name, I renamed it into Karmilla. The package includes a version that has been encoded for web use by FontSquirrel. The autohint works very well, I tested the font in IE7/Windows XP and it’s perfecty readable. Feel free to use Karmilla in your projects, or improve/extend it with your own glyphs. Useful and really interesting fork. Did you think about adding the ‘ß’? @Mark : didn’t think about it yet, but it sounds like an obvious addition. I just opened a ticket for this. Great work! But would it be possible to add the latin extended characters found in Polish? I’m thinking about ę ą ó ł ś ć ń ż ź and their capital counterparts. I am looking for a good sans serif for my project, and I haven’t been 100% happy with any of those I found… But Karmilla would, if it had these characters, and I’m not qualified to add them myself. @Marek that sounds like a nice challenge! Will try to tackle that when I have a moment (not this week). That’s great to hear, can’t wait to see the results.